A percussion instrument consisting of a set of metal bars which are sounded by being struck with a hammer. Each bar produces a specific tone. The bars are arranged in the same manner as a piano keyboard, and thus the orchestra bells are fully chromatic. 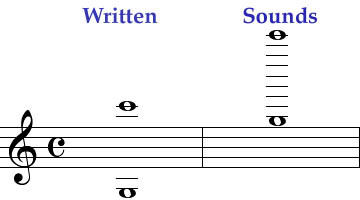 The written range is from G3 to C6'' and sounds two octaves higher than written. The bell lyre and glockenspiel are versions of the orchestra bells designed for marching.